The Cinema Guild celebrates Easter on April 23 at 7:30 p.m. with Monty Python’s Life of Brian. Sure, it’s a touch heretical, but so is Jesus Christ Superstar, and at least this one has better songs. After their first feature film ended up being one of the funniest movies ever made, and almost certainly the most-quoted, the Monty Python comedy troupe must have felt a lot of pressure on their follow-up. 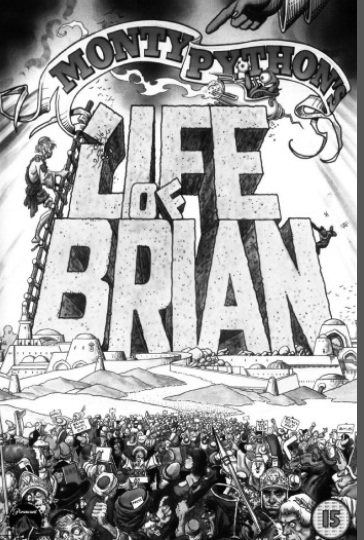 Life of Brian can’t really approach Holy Grail, but then, what can? And besides, it has its own pleasures, like Michael Palin as an Elmer Fudd-fied version of Pontius Pilate and Graham Chapman as his lisping friend Biggus Dickus. Or Terry Gilliam animating Dore etchings and Roman sculptures while a singer dramatically informs us that Brian has legs and feet. Or Brian’s rescue by a spaceship piloted by rubber aliens who hold their eyes in arms sticking out of their heads. Oh, don’t expect that to make any more sense in context either. But I guess this movie does have something like a plot, so I might as well attempt to describe it. Brian Cohen was born across the street from Jesus in first-century Israel, inspiring his mother in an attempt to mooch off the directionally-challenged wise men. He grows up to join the rebellious Judean People’s Front in the midst of its schism with similar organizations (“Whatever happened to the Popular Front?” “He’s over there.”). Later, while posing as a street preacher he inexplicably gets a huge and devoted legion of followers. And in between, we get an excuse for all kinds of Pythonian shenanigans involving naked hermits, ex-lepers, stonings, and the children’s matinee gladiator show. That said, this is some of the most pitch-black comedy ever put on screen, as we watch the hapless Brian get tossed around by greater society to his inevitable death by crucifixion. John Cleese, as the head of the JPF, congratulates Brian for being a “doer,” but that is about as far from the truth as you can get. He simply falls from one disaster into another, and really can’t seem to do anything about it. When he tells his increasingly fanatical followers to buzz off, they will look in his words for any possible deeper meaning except that he wants them to buzz off. If Kafka took over Saturday Night Live for a season, this is about what it would look like. Condemened to die for no apparent reason, he is almost rescued three different times, most memorably by his rivals the People’s Front of Judea on a suicide mission (they commit suicide). But after every false hope, Brian is still hanging there. The crucified Eric Idle leads them all in a rousing singalong of “Always Look on the Bright Side of Life,” as they wait to die, but even he admits that “life’s a piece of ****/when you look at it.” It might be the bleakest ending in comedy history, and it’s definitely proof that hysterical laughter and existential hopelessness don’t have to be mutually exclusive.